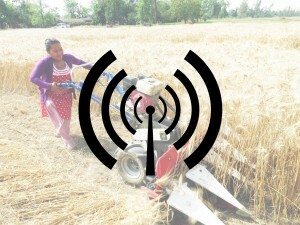 CSISA has collaborated with the District Agriculture Development offices in four districts in Mid and Far West regions of Nepal to produce radio jingles in local languages to spread awareness, among other topics, on the importance of irrigating wheat during tillering and flowering stages in winter. The jingles are being aired six times a day for 20 days by Krishna Shara FM and Dinesh FM, two popular FM radio stations. More than 80% of farmers in these areas of Nepal irrigate their wheat only once, at the beginning of the season, and lack awareness about the yield benefits of providing a second irrigation to wheat in winter. By sowing wheat early, farmers in India are doubling production and avoiding crop failure resulting from earlier summers and higher temperatures. Farmer Nathuni Singh is a man who speaks with wisdom. Though most would attribute this to his age—he is 74—Singh says that every farmer is forced to grow wise earlier than usual. “It’s the vagaries of nature that make a farmer learn the hard way,” he says. Singh began farming at age 28, soon after his father’s death, and since then has seen nature change course many times. “Nature has always been unpredictable. I have lost many of my crops to untimely rains and drought. But things have worsened in recent times. With every year, the sun seems to be getting hotter and harsher,” says Singh. For Indian farmers like Singh, climate change has become a stark reality. The country today is the world’s third largest emitter of greenhouse gases, an alarming statistic as 58 percent of India’s population depends directly on agriculture as its primary source of income. While USAID partners with India to reduce the country’s greenhouse gas emissions using sustainable technologies over the long term, relief is needed right away for farmers. In response, in 2009, USAID established the Cereal Systems Initiative for South Asia (CSISA) to help farmers adapt to climate change and rainfall variability. CSISA is a public-private partnership with Government of India research institutions and private sector partners, and is led by the International Maize and Wheat Improvement Center (CIMMYT). “Even in the eastern Indo-Gangetic plains, one of the most fertile regions in the world, we saw farmers lose 25 percent of their crop harvest due to summers arriving ahead of schedule. Where summers previously didn’t begin until May, temperatures now reach 40 degrees Celsius (104 degrees Fahrenheit) by the end of March,” says R. K. Malik, a CSISA senior agronomist. To counter the impact of excessive and untimely heat due to climate change, CSISA began reaching out to wheat farmers in eastern Uttar Pradesh and Bihar, advising them to plant their wheat crop a month sooner than usual and without first tilling the land in the traditional way. “By sowing before Nov. 15 instead of the end of December, as is the practice in the region, the grain is able to fully develop before the heat wave arrives, which can cause the grain to shrink and lead to crop failure,” says Malik. However, this unique wheat sowing method found very few takers. “Initially, when we started in 2009, only four farmers agreed to plant their wheat early. One of them was Nathuni Singh,” Malik said. Singh first heard about this new planting method when CSISA representatives came to his village of Devpokhar in eastern Uttar Pradesh to demonstrate how the technique can benefit poor farmers like him. Being the sole bread winner for his family of nine and having grown only 390 kilograms of wheat in the previous year—far below average—Singh was desperate for help. “The CSISA team gave me seeds and fertilizers, and guided me on when and how to sow the seeds without irrigating the land. They even assured me that, if the crop failed, they would repay me for the losses I bear,” he said. For Ashwini Nayak and Ramawadh Chaudhary—two of the other four farmers who first adopted the early wheat sowing practice—it was the science behind the method that finally convinced them. “Rice is a water-intensive crop. By planting wheat immediately after harvesting the rice, the wheat crop uses the remaining moisture present in the soil to develop. As a result, you not only save water but also the diesel cost required to run water pumps for plowing and irrigation,” explains Nayak, echoing the scientific tone of a CSISA officer. Ramawadh Chaudhary in his field. But for the three farmers, the decision to move away from the traditional farming technique soon became an uneasy choice. “Everyone in the village used to laugh at us. They called us stupid because we planted our crops without tilling the land and before the season began,” says Chaudhary. And it was a risk that paid off for each of them. The three farmers not only managed to double their wheat production, but also saved additional expenses such as the cost of irrigation and ploughing. “I used to spend about rupees 30,000 ($470) on my 6-hectare farmland, which included the cost to hire a tractor for plowing the field and diesel for running the tractors. Now I’m saving all of this,” says Chaudhary, who last year bought 4 more hectares of farmland with the savings. Today, over 620,000 farmers across the provinces of eastern Uttar Pradesh and Bihar grow their wheat using CSISA’s early sowing method. “The farmers found that the technique increased their grain yield by 485 kilograms per hectare. In fact, compelled by our success, even the Bihar State Department of Agriculture now officially recommends wheat farmers to plant before Nov. 15,” says Ajay Kumar, an agricultural scientist working at CSISA’s eastern Uttar Pradesh hub. Buoyed by its success in India, CSISA, in partnership with USAID, is introducing the practice to thousands of farmers in Nepal and Bangladesh. Singh is excited to hear his success story being replicated outside India’s borders. “At present, the high-quality wheat that I’m growing is being sent to farmers in neighboring states like Uttarakhand. Now my wheat will also travel to Nepal,” says a smiling Singh. Meanwhile, at Singh’s newly constructed house, farmers from neighboring villages arrive almost every month to inquire about the early wheat sowing method and to learn from his success. “I first welcome them and give them tea and snacks because many come from very far places. I then take them to my farm to show them how the seed is planted and when to put the fertilizer,” says Singh. After his one-hour training session, Singh offers his guests a glass of water and bids them farewell with the hope that the farmers he trained will also prosper like him. “There is an old saying that the one who feeds the hungry is equal to God. A farmer struggles against many uncertainties and toils every day in the fields so you and I can have food in our plates. He needs to be given the right support and made sure that he is not left alone to struggle,” adds Singh. This article is authored by Neha Kathor for FrontLines, the news publication of USAID. In Kalukhali, Rajbari district, Bangladeshi farmers mostly cultivate paddy, which requires engaging a large labor force in order to harvest the crop. Mohammad Rafiqul Islam, an experienced agricultural service provider, was keen to minimize labor expenses in order to accelerate his business profits. After seeing a reaper in the neighboring village that harvested the crop faster, thus helping in timely planting of the subsequent crop, he decided to purchase this new machine. Imported and marketed by ACI company, this machine was suitable for reaping wheat and Amon and Aush paddy. 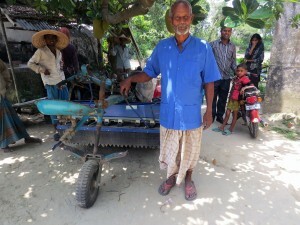 “Initially, my family members were against the big investment of US$ 2,360 for purchasing this machine,” said Rafiqul. “They told me this will be a costly deal,” he added. Previously, Rafiqul would hire 10 laborers for around two weeks to harvest 3.57 hectares of land, which used to cost him around US$ 1,300. Despite facing resistance at home, Rafiqul bought the reaper anyway, and he didn’t regret it. Even after hiring a machine operator and purchasing fuel, Rafiqul could save around US$ 1,230 in labor costs from harvesting his land in less than two weeks. Additionally, he generated an income of US$ 76 by providing harvesting services to others for one more week. “The demand for reaper services will increase in the dry season, and if weather conditions remain favorable, more than 20 hectares of land can be harvested by the machine,” said Mohammad Jahangir Jowarder, a reaper operator working with Rafiqul Islam. The benefits extend beyond the farm and are helping make Rafiqul’s family life more comfortable. “Earlier, during the harvest season I could not sleep more than three hours per night. I had to prepare at least four meals for ten laborers as well as dry, thresh, pack and store around 80 kg of paddy every day. But this time it’s different. I am able to rest in the evenings – first time in 30 years!” laughed Rafiqul’s wife Shirin Sultana, who originally opposed the decision to invest in the machine. So far, local service providers have supported more than 6,000 farmers with this machine covering 2,200 ha of farm land. “The reaper is fast becoming popular among farmers. In short time, 55 local service providers have bought the reaper and harvested more than 2,000 hectares of land of more than 6,000 farmers,” said Subrata Chakrabarty, Project Manager, CSISA-MI. “It can be the most extensively used technology for rice and wheat harvesting in the next five years in Bangladesh,” he added. Funded by USAID, the Cereal Systems Initiative in South Asia – Mechanization and Irrigation (CSISA-MI) Project – part of US President Obama’s Feed the Future (FtF) Initiative – is facilitating the market promotion of the reaper machine in collaboration with ACI. CSISA-MI seeks to transform agriculture in southern Bangladesh by unlocking the potential productivity of the region’s farmers during the dry season, while conserving the land’s ability to produce quality crops in the long term through surface water irrigation, efficient agricultural machinery and local service provision. This article is authored by M. Shahidul Haque Khan, Communications Officer, CIMMYT-Bangladesh. The rates of growth of staple crop yields in South Asia are insufficient to meet the projected demands in the region. With 40 percent of the world’s poor living in South Asia, the area composed of eastern India, Bangladesh and Nepal has the largest concentration of impoverished and food insecure people worldwide. At the same time, issues of resource degradation, declining labor availability and climate change (frequent droughts and rising temperatures) pose considerable threats to increasing the productivity of farming systems and rural livelihoods. Thirty percent of South Asia’s wheat crop is likely to be lost due to higher temperatures by 2050, experts say. According to McDonald, there have been some successes due to increased investment and focus on intensification in these areas over the past 10 years. A CIMMYT-led initiative, the Cereal Systems Initiative for South Asia (CSISA) has contributed to major outcomes such as rapid uptake of early-planted wheat, the use of zero-tillage seed drills and long-duration, high-yielding wheat varieties in eastern India. CSISA, in close collaboration with national partners, has been working in this region since 2009 to sustainably enhance the productivity of cereal-based cropping systems, as well as to improve the livelihoods of millions of smallholder farmers. To increase the spread of these innovations and increase farmers’ access to modern farming technologies, CSISA is working to strengthen the network of service providers. The U.S. Agency for International Development and the Bill & Melinda Gates Foundation have recently approved phase III of CSISA, running from December 2015 to November 2020. Building on the momentum and achievements of phases I and II, phase III will work to scale up innovations, strengthen local capacity and expand markets to support the widespread adoption of climate-resilient agricultural technologies in partnership with the national and developmental partners and key private sector actors. “CSISA has made its mark as a ‘big tent’ initiative that closes gaps between research and delivery, and takes a systems approach that will continue to be leveraged in phase III through strategic partnerships with national agricultural systems, extension systems and agricultural departments and with civil society and the private sector,” said McDonald. CSISA is led by the International Maize and Wheat Improvement Center (CIMMYT) and implemented jointly with the International Rice Research Institute and the International Food Policy Research Institute. The four primary outcomes of phase III focus on technology scaling, mainstreaming innovation into national systems, development of research-based products and reforming policies for faster technology adoption. This article is authored by Anuradha Dhar, Communications Specialist, CSISA. Despite continuous pessimistic murmurings, South Asia is not in the depths of a Malthusian crisis. While population growth rates are high, they are slowing. And although food staple yields are low relative to the rest of the world, they are still inching upwards. The dark and dreary picture of a hungry future may persist in our collective outlook for the future, but it won’t be for a lack of available food. In South Asia, hunger and malnutrition will remain the province of social and economic entitlements, gender relations, health and nutritional status and the quality of food. But we shouldn’t be complacent. Achieving sustained yield growth requires continued investments in modern science, agricultural research and development and extension. And continued yield growth on a sustainable basis — growth without environmental degradation — is increasingly viewed by South Asian leaders, entrepreneurs and civil society as the only way forward. Well-structured public policies can incentivize smallholder farmers, rural entrepreneurs and consumers toward choices that are more or less welfare-improving, yield-enhancing or environmentally sustainable. For example, a tax or fee for groundwater use can stem the excessive extraction of this scarce resource in regions where aquifers are already threatened by overexploitation. Conversely, tariffs and non-tariff barriers to the import of low-cost irrigation equipment can prevent widespread adoption of supplemental irrigation, as was the case in Bangladesh until the late 1980s. Governments have a fairly wide range of policy tools at their disposal. They can enact laws, establish guidelines and regulations, invest in programs and projects, introduce or withdraw taxes and subsidies and set the rules for trade and investment. Each application of a policy tool is accompanied by resulting outcomes, trade-offs and possibly unintended consequences. CSISA’s greatest challenge has been to work with its partners and stakeholders to identify the appropriate policy tools with which to achieve the desired outcomes, while also being cognizant of the concurrent trade-offs and consequences. CSISA’s policy work has aimed to develop a critical mass of research needed to promote an actionable and evidence-based agenda for improving public policies to address South Asia’s cereal systems. In doing so, CSISA has weighed in — through both scholarly research and outreach efforts — on several areas related to sustainable intensification of cereal systems in South Asia’s most risk-prone geographies. For example, CSISA’s policy work has strengthened the quality of the debate and helped frame the ongoing contestation around seed systems development in the region. CSISA has helped policymakers identify key priorities amid all the noise accompanying the discourse about the proper role for state-owned enterprises in seed distribution in Bangladesh, the role of private and foreign direct investment in the seed market in Nepal and the future of genetically modified crops in India. Similarly, CSISA’s policy work has tackled the question of input subsidies and their impact on sustainable intensification. Blanket subsidies on seed, machinery and equipment are common public interventions throughout the region, but, while they can be useful in encouraging new technologies and practices among smallholders, they often come at a high price: forgone spending on other development priorities, elite capture of the subsidies, distortion of input markets and crowding-out of private investment. For example, CSISA’s work on the economic and environmental trade-offs associated with poorly targeted subsidies for laser land levelers in eastern Uttar Pradesh provides state and local government with alternative strategies for improving the impact and lessening the damages caused by subsidies. Finally, CSISA’s policy work has been striving to transform research and extension guidelines and recommendations from very linear and top-down models to something more nuanced — something more in tune with the precision and site-specificity required for sustainable intensification in the risk-prone geographies in which CSISA operates. CSISA efforts have highlighted the importance of recognizing heterogeneity within populations targeted for the dissemination of new cultivars, agricultural equipment and inputs, as well as the potential to use this heterogeneity to tailor interventions for greater efficacy. CSISA research and outreach efforts have emphasized the potential for tailoring extension messages to female household members as a means of transmitting information to both men and women about new technologies. And CSISA efforts have drawn attention to the complexity of systems-based solutions for sustainable intensification and the opportunities to bring more smallholders on board through programs that tie public research and extension to private service providers, input suppliers, crop aggregators, community-based organizations and other market actors. There is still a lot for CSISA to do to improve the policy environment for sustainable intensification in South Asia. New partners are needed, both to build a strong evidence base and to carry that evidence forward to government and corporate decision-makers. New audiences are needed to scrutinize and lend support to the social, economic and environmental goals of this work. And a clear understanding of the long-term nature of this engagement is needed to ensure that policy decisions in support of sustainable intensification have the desired impact and scale. This article is authored by David Spielman, Senior Research Fellow, International Food Policy Research Institute (IFPRI). CSISA has collaborated with a women farmers’ group in Bardiya district to collectively evaluate improved rice and lentil varieties and better bet agronomic practices. These trials have helped bring CSISA researchers closer to farmers’ needs and have led to increased adoption of new technologies by women farmers. Loktantrik Mahila Krishak Samuha (Democratic Women Farmer Group) was formed in 2011 in the village of Neulapur in Bardiya district of Nepal to economically support poor women members and to improve their skills in new agricultural technologies. The group, with 33 active members, now has a savings fund of NRs 250,000 (US$ 2,500), and is able to make low-interest loans to members. Since 2013, CSISA-NP has been working with this group on research activities, trainings and demonstrations. Group members participated in CSISA’s evaluation of rice varieties, as well as trainings and demonstrations on rice production technologies and crop establishment methods. Among rice hybrids, the group members were able to choose from varieties such as DY 18, DY 69, Arieja and Prithivi due to their high yielding potential and fine grain quality. The women group members expressed a preference for fine grain rice varieties for home consumption and coarse grain varieties for selling in the market. In the winter of 2013 and 2014, a large number of farmers from the group also participated in adaptive research trials on lentil varietal selection and different agronomic practices. The group preferred Khajura 2 (released), ILL 7723 (enriched with iron and zinc) and Black Masuro, but did not express a preference for the other varieties produced. The average yield of improved varieties of lentil is 1,200 kg per hectare in farmers’ fields, which is nearly 50 percent higher than the commonly used variety. The group members also earned additional income by selling lentil seeds, which were produced from these new varieties. 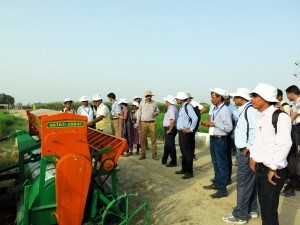 CSISA also introduced the group members to direct seeded rice (DSR) technologies, using both four-wheel tractor seed drills and Chinese two-wheel tractor seed drills. DSR, a technology that can provide significant cost savings to smallholder farmers, can be particularly attractive when labor availability is constrained as it eliminates the need for nursery bed preparation, puddling and transplanting of seedlings into the main field. DSR also reduces water requirements, while still providing similar grain yields achieved with transplanted puddled rice. Livestock provides an important complement to cereal farming-based livelihoods in South Asia and can increase incomes for millions of crop-livestock farmers. In collaboration with other CSISA partners, the International Livestock Research Institute (ILRI) has been helping crop-livestock farmers to boost income and milk production by increasing the availability of fodder, promoting efficient use of cereal residues and improving the quality of supplementary feeds in India, Bangladesh and Nepal. ILRI applied the lessons learned during CSISA Phase I regarding multi-disciplinary R&D, working in innovation hubs, adapting technologies for new contexts and forming strategic partnerships in CSISA Phase II in order to intensify the uptake of locally adapted feed interventions and strengthen farmer linkages with input (including service) and output markets. ILRI explored business opportunities in CSISA’s new hub in Odisha, as well as new sites in Bihar, south-west Bangladesh and the far west of Nepal. In Phase II, ILRI focused on technology development and adaptation, as well as capacity development among partners for the uptake and scaling out of proven technologies and best practices. Tangible impacts included higher milk yield (10-14 percent) and better milk quality (1-3 percent higher fat content), which translated into higher income from milk sales (additional US$ 50-150/animal/year) and/or reduction in feed costs (30 percent savings from less waste due to chopping, for example). The increased uptake of locally-adapted livestock feeding practices introduced by CSISA have contributed to improved livestock productivity. In Bihar, 1,500 farmers across six districts (Samastipur, Muzzafarpur, Begusarai, Vaishali, Ara and Patna) have adopted urea-treated maize stover as feed, and self-prepared balanced concentrate feed and mineral mixture as feed supplements to basal diets of their dairy cows. In Odisha, around 1,200 farmers across three districts (Puri, Bhadrak and Mayurbanj) have adopted chopped straw and fodder grass as essential diets of their dairy cows, supplemented with improved concentrated feed and mineral mixture. In Bangladesh, 150 farmers have adopted maize stover as feed and over 1,500 farmers have been practicing mechanical chopping of crop residues, of which two out of every three is female. In Nepal, 700 farmers (in five village development committees) have adopted chopped straw as basal diet supplemented with self-prepared balanced concentrate feed and mineral mixture, an increase from 10 percent (pre-CSISA interventions) to 40 percent among farmers inside and outside CSISA’s farmer-group collaborators. The increased availability of high-quality chopped fodder reflects the emergence of derived demand for complementary inputs and services to sustain the adoption of new feed technologies and best practices. Through various trainings and capacity-strengthening activities, auxiliary service enterprises were developed, revealing the entrepreneurial tendencies of our collaborators, expanding their livelihood opportunities in the process. 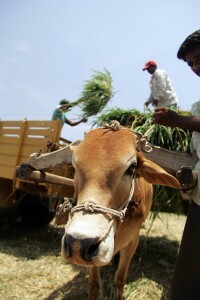 For example, eight local service providers (LSPs) in Bihar and five LSPs in Odisha have been established for preparing balanced concentrate feed, while 12 LSPs have been established in Bangladesh to provide straw chopping services in response to increased demand for chopped straw and fodder. In addition, two fodder markets in Shanerhat and Pirgong in Bangladesh’s Rangpur district were established in collaboration with local partners to serve increased demand for fodder, which have made fodder easily accessible and widely available while providing income-generating opportunities for fodder growers. With the introduction of fodder crops and forages as part of a basket of feeding options, farmers in CSISA sites were able to expand their feed resource base, helping them mitigate productivity constraints arising from seasonal variability and the generally low quality of available feeds. This article is authored by Lucy Lapar, Senior Scientist and Agricultural Economist at the International Livestock Research Institute (ILRI). How can agricultural research organizations rapidly and effectively reach large numbers of farmers with messages on improving crop productivity? The overwhelming number of farmers in rural Bangladesh presents formidable challenges to turning research into impact through agricultural extension and farmer training. Through CSISA, the International Maize and Wheat Improvement Center (CIMMYT) in Bangladesh and Agricultural Advisory Society (AAS), an NGO, have worked to overcome this challenge through the use of rural village and television video screenings. This initiative was recently awarded the prestigious international Access Agriculture Award for the use of training videos for farmer outreach in 2015. The Video Outreach award is awarded each year to organizations that show exceptional and inspiring use of video to reach farmers and improve their livelihoods by supplying relevant and entertaining training messages in local languages. Between 2012 and 2014, CIMMYT-Bangladesh and AAS jointly organised 482 screenings of the Bangla language video ‘Save more, grow more, earn more’ that introduces farmers to the use of small-scale agricultural machinery, which can be attached to two-wheeled tractors for seeding and fertilizing crops in a way that saves fuel and labour, allowing farmers to profit more while reducing irrigation requirements. 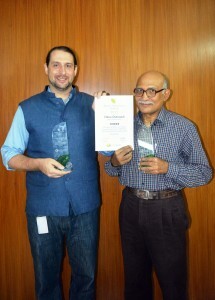 Timothy Krupnik and Harun-ar-Rashid with the Access Agriculture Video Outreach Award. Filmed and produced by Agro-Insight in consultation with CIMMYT and the Bangladesh Agricultural Research Institute, use of the video for farmer outreach was done as part of the USAID- and Bill & Melinda Gates-funded Cereal Systems Initiative for South Asia (CSISA), with screenings held throughout Bangladesh’s Feed the Future zone. Locations included farmers’ fields, markets, schools, community centres, tea stalls and in total, over 110,000 farmers saw the videos in rural village showings. ‘Save more, grow more, earn more’ was also aired by the popular television program, Mati-O-Manush, on BTV 12 times, resulting in a documented viewership of 28 million people nationwide. An additional 3,000 DVDs were distributed by 20 groups of volunteer organizations, including the Department of Agricultural Extension, the Bangladesh Agricultural Research Council, and local NGO and CBOs, who independently organized screenings. Follow-up research indicating each volunteer reached 180 people each. Similar organizations were engaged by AAS to facilitate additional volunteer showings in 332 communities in 11 districts across south-west Bangladesh. These efforts were documented in a scientific research paper, published in the international peer-reviewed Journal of Agricultural Education and Extension, that analyzed the effectiveness of volunteer groups to distribute videos to larger audiences of farmers. The award was declared and handed over to the recipient organizations on 12 November in Nairobi, Kenya, in Eastern Africa. To watch the Access Agriculture Video Award Ceremony online, click here. This article is authored by Mohammad Shahidul Haque Khan, Communications Officer, CIMMYT Bangladesh. “Since my childhood I have been fascinated by machines and always look for ways to improve efficiency of my farming operations,” says 82 year-old farmer, Md. Abdur Rahman from Jessore district in southern Bangladesh. After attending a machinery demonstration event by CSISA-Mechanization and Irrigation (CSISA-MI) this year, Rahman started using the seeder fertilizer drill (SFD). “I came to know about seeder fertilizer drill, which could be attached to my existing two-wheel tractor and can simultaneously till, seed and fertilize in line with greater precision and saves energy,” adds Rahman. His excitement is shared by farmers in the district, who are adopting new agricultural machines to generate more profit. Through CSISA-MI, resource-conserving and labor saving farm machines such as axial flow pumps, seeder fertilizer drills, rice transplanters and reapers have been introduced in southern Bangladesh. As part of USAID’s Feed the Future initiative, the program works in collaboration with private sector and government (Bangladesh Agricultural Research Institute and the Department of Agricultural Extension) partners to expand sustainable intensification, reduce fallow areas, increase farm incomes and help solve agriculture labor crisis. “Last season, I saved over US $25 and hope to save the same amount in this season by tilling, seeding, fertilizing and leveling my land with this seeder machine,” says Rahman, who bought the SFD for US $458 and works with his nephew to operate this machine on his farm. He also plans to start an SFD service business in his area from this coming dry season. He will charge US $25 per acre and hopes to cover 30 acres, which will give him a revenue of US $770 for tilling and seeding. Rahman likes to work on machines and has worked with the CSISA-MI team to improve his machine performance by modifying the metal work under the seed box, preventing dirt from clogging and infiltrating the seed box during use. “With this machine, you can do a number of things at one go and so you are saving your money, time and reducing intervals between crops. In agriculture if you can save time, you can maximize production as well as increase cropping intensity that will earn additional income,” says Rahman to other farmers in the area, who are eager to adopt the SFD after seeing Rahman’s profit. This article is authored by M. Shahidul Haque Khan, Communications Officer, CSISA-MI. In the last five years, CSISA has reached over 25,000 farmers and has covered more than 70,000 acres through water- and labor-saving agricultural technologies in the South Indian state of Tamil Nadu, as reported during the CSISA Tamil Nadu Hub Celebration Workshop from 15-16 September in Thanjavur (participants of the workshop pictured above). As part of CSISA, the International Rice Research Institute (IRRI) tested and scaled-out improved rice crop technologies and management practices including laser land leveling, mechanized dry direct seeding of rice, mechanical transplanting of rice, site-specific nutrient management and line sowing using a multicrop seeder under reduced-tillage conditions. These technologies are helping farmers reduce the cost of production and increase their income in Thanjavur, Thiruvarur and Nagapattinam districts of the Cauvery Delta and the neighboring districts of Ramanathapuram and Sivagangai. Sivagangai and Ramanathapuram districts are two of the most arid areas in Tamil Nadu. With almost 73 percent of the population depending on agriculture, paddy is a staple crop grown only during the dry season (rabi), mainly under rainfed conditions, with seeds broadcasted before the rains. The practice of dry direct seeding of rice, which requires less water and labor, is helping transform uncultivable lands (geographically about 50 percent of the area) to productive agricultural areas in these districts. The Reliance Foundation and CSISA have been working in partnership to convert dry tracts of lands from traditional broadcasted rice to dry direct seeded using a seed drill. As a result, 250 hectares in Sivagangai have already become cultivable and farmers’ groups have purchased 11 seed drills and are renting out the equipment to other farmers. The Tamil Nadu Rice Research Institute, National Bank for Agriculture and Rural Development, ITC Agribusiness division, Syngenta, MS Swaminathan Research Foundation (MSSRF) and the Reliance Foundation are among several partners who supported the research, capacity-building and extension work for large-scale adoption of the technologies. The Nutrient Manager for Rice (NMR), an ICT-based decision tool that gives real-time site-specific fertilizer recommendation, is helping farmers use less fertilizers as compared with farmers’ current practice, thus increasing their profits by US$ 67 per hectare on average. This tool, introduced by CSISA in the Cauvery delta, provides fertilizer guidelines matching the field-specific needs and conditions of a farmer, according to IRRI scientist P. Panneerselvam. “Fertilizers are typically the second largest input cost in rice production,” said Panneerselvam. “Thus, Nutrient Manager for Rice is a welcome technology in Tamil Nadu.” NMR supports and complements the existing crop management advisory services of the state government. Based on the information provided by farmers about their fields, Nutrient Manager recommends the ideal amount of nitrogen, phosphorus and potassium to be added at critical growth stages, while taking into account the amount of fertilizer the farmer prefers to use. With the use of NMR, farmers can save 15-20 percent of nitrogen, 36-42 percent of phosphorous and 28 percent of potassium compared with state fertilizer recommendation; and 33-42 percent phosphorous and 30 percent potassium compared with farmer’s practice. These were the results from an on-farm participatory research done from 2013 to 2015 in Thanjavur, Thiruvarur, and Nagapattinam districts in Tamil Nadu. Partner organizations such as TNAU and MSSRF have agreed to extend the research and development initiatives under CSISA, beyond the project life-cycle. “TNAU will take up the outscaling of key technologies under CSISA although the project has already ended,” said R. Rajendran, TNAU agronomist, who has been associated with CSISA for the last seven years. “TNAU will continue by extending technologies such as improved dry seeded rice cultivation, nonpuddled machine rice transplanting and laser land leveling,” Rajendran said. “Also, the research initiatives conducted through CSISA will not stop. The research outcomes will be taken continually to the farmers with the support from the Government of Tamil Nadu and TNAU,” he added. The Tamil Nadu Rice Research Institute and the Soil and Water Management Research Institute will also continue to expand the adoption of the water- and labor-saving technologies in the Cauvery Delta and the entire rice-growing areas of Tamil Nadu. “MSSRF is now extending the training to farmers after its staff members attended the season-long training on dry direct seeded rice,” said G. Sudhakar, scientist at MSSRF. The season-long training was piloted by CSISA where participants received hands-on training on all aspects of crop production and management — from sowing to grain storage — during the entire growing season. The original version of this article appears in the IRRI News Bulletin. Over the past six years, wheat breeding for biotic and abiotic stress tolerance has gained momentum in South Asia through effective collaboration with national partners under the umbrella of CSISA, according to Arun Joshi, Principal Scientist, CIMMYT and CSISA Objective 4 Leader. Joshi said that new wheat varieties have been developed that have faster grain filling ability and can adapt to a range of sowing dates. “Improved networking with public and private sector seed hubs enabled faster inclusion of these new varieties in the seed dissemination chain,” added Joshi. Fifty scientists from Bangladesh, Bhutan, India and Nepal assembled at Karnal, India on 2-3 September for the 7th Wheat Breeding Review meeting, reflecting the growing interest of the national agriculture research systems (NARS) in South Asia in genetic gains and CSISA’s seed dissemination work. In addition to assessing the broad framework of issues that currently concern wheat improvement, the meeting reviewed the progress of the 2014-15 cycle and established work plans for the coming crop cycle. According to Indu Sharma, Director, Indian Institute of Wheat and Barley Research, Indian Council of Agricultural Research, collaborative research with a regional perspective will be important to achieve food security and sustain farmers’ livelihoods in the future. While appreciating new research efforts, she highlighted that CSISA has played a critical role in wheat research focused on handling rust resistance and heat tolerance in South Asia. Participating scientists from CIMMYT and national public partners discussed strategies to strengthen research on future threats such as wheat rusts, early and late heat stress and water scarcity. Wheat rusts have been known to be a constant threat causing severe losses to wheat production worldwide. “The threat from rusts is particularly acute in South Asia, which produces 20 percent of the world’s wheat. Recently, yellow rust has become extremely threatening for India, Pakistan and Nepal,” Joshi highlighted. CIMMYT’s resistance breeding programs continue to keep these diseases (including Ug99) in control, safeguarding farmers and their incomes. According to Joshi, disease-resistant varieties are one of the most effective control strategies for most diseases of wheat grown by resource-poor farmers in the developing world. For a farmer, the cost of protecting 1 hectare of wheat against disease through the application of modern chemicals is estimated to be US$ 10-80 per hectare. With the use of disease-resistant varieties, farmers can save this cost as the rust resistance in wheat is embedded in the seed. Various sessions reviewed progress and plans from 10 national research centers. After a gap of 20 years, the partnership between the Bhutanese national research program and CIMMYT has led to the release of three new wheat varieties, informed Sangay Tshewang, Wheat Co-ordinator, Renewable Natural Resources Research & Development Sub Centre, Tsirang, Bhutan during his presentation. Enhancing the capacity of wheat scientists in the region and establishing linkages between breeders, seed producers and farmers featured among the other themes discussed during the meeting. Looking ahead, many national scientists stressed that they would focus on increasing linkages and improving coordination between the national research programs, CIMMYT and other stakeholders in the seed business to create an enabling environment for faster release of new varieties to farmers and strengthened capacity to handle disease and climate change threats. Enhancing the productivity of the rice-wheat cropping systems in the Indo-Gangetic Plains is essential for ensuring food security for more than 20 percent of the world’s population. Such enhancement is particularly important in the relatively impoverished and food insecure regions of eastern India, Nepal and Bangladesh. In the eastern Indo-Gangetic Plains, farmers must regularly contend with risks posed by high temperatures during the wheat grain filling period. These risks can reduce yields by more than 50 percent — even with good management. In addition, progressive climate change has already affected the region, making adaptation to heat stress an urgent near and longer-term priority for ensuring regional food security and climatic conditions are expected to worsen significantly in the coming decades. 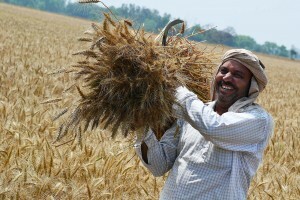 Under the CSISA umbrella, the International Maize and Wheat Improvement Center (CIMMYT), in close collaboration with the national wheat programs in India, Nepal and Bangladesh, has released new wheat varieties with higher yield potential, which perform well even in the stress-prone areas of the eastern Indo-Gangetic Plains. Nevertheless, the long-term solution to heat stress cannot be found in any single technology; it must draw from several approaches, including adjustments to management practices, genetic advances, efficient irrigation technologies and mechanization. CSISA efforts have identified timely wheat planting as the most important contemporary determinant of wheat yields in farm fields across the eastern Indo-Gangetic Plains. In 2009, CSISA began to promote early sowing of wheat to combat the negative effects of rising temperatures. Due to ingrained habits in places like the eastern Indian state of Bihar, few farmers were initially willing to sow their wheat in early November, even on a trial basis. Through community-based evaluations and collaborative research trials with partners such as the Research Complex for the eastern region, CSISA has built a compelling body of evidence for the importance of early planting. As a result, public perception and official recommendations have changed, resulting in more than 600,000 farmers planting wheat earlier in the Indian states of Bihar and Uttar Pradesh. CSISA has also worked to expand access to sustainable intensification technologies that facilitate early planting methods, such as zero tillage. With assistance from CSISA, more than 1,600 entrepreneurs are currently providing zero tillage services to over 100,000 households in eastern India and farmers have achieved significant wheat yield gains (20 percent) and cost savings ($100 per hectare). With USAID’s Feed the Future support, CSISA pursues climate-smart strategies that are profitable today and fully supported by the public and private sectors to help farmers in the eastern Indo-Gangetic Plains build toward a more food secure future. This article is authored by Andrew McDonald, CIMMYT Cropping Systems Agronomist and CSISA Project Leader. It was originally published in the Feed the Future Newsletter. Estimates show that as of 2013, nearly 1.5 million hectares of arable cropland in India have been brought under conservation agriculture (CA)-based practices. Outside of northwest India, however, the concept remains relatively unfamiliar to farmers and extension personnel. Against that backdrop, the Cereal Systems Initiative for South Asia (CSISA) conducted an intensive training program on CA from 2-11 September for researchers from the national agricultural research and extension system (NARES). Organized at the Central Soil Salinity Research Institute (CSSRI) in Karnal, Haryana, the training focused on developing resilient systems through CA-based management practices. The objective was to train researchers to accelerate farming system adaptation to climate risks through CA-based best-bet management practices that reduce vulnerability. A total of 18 researchers participated in the training, which was inaugurated by Gurbachan Singh, Chairman, Agricultural Scientists Recruitment Board (ASRB), New Delhi. Participants received hands-on-training on CA technologies and visited various participatory and strategic trials during the program. Singh highlighted the importance of the program saying that CA can improve the productivity and profitability of India’s cropping systems under aberrant weather situations in different agro-climatic zones of the country to sustain food security, while maintaining and improving the quality of the natural resource base. Globally, the positive impact of CA-based techniques on natural resources, climate change adaptation and mitigation have been widely acknowledged. In India, realizing the importance of CA, more strategic research on precise nutrient application, water, cultivars and weed management has been initiated only in the recent past. In his presentation, R.K. Malik, CIMMYT Senior Agronomist and CSISA Objective 1 leader, focused on the need to design resource use-efficient, diversified and resilient cropping systems as an alternative to intensive rice-wheat systems. He further highlighted the issues of groundwater depletion, declining soil health associated with multiple nutrient deficiencies, pest outbreaks and shift in weed flora. On the other hand, M.L. Jat, CIMMYT Senior Scientist, stressed upon how the convergence of technologies has helped make climate-smart agriculture a reality that helps safeguard farming systems from weather abnormalities. Praising the training program, Rameshwar Singh, Project Director, Directorate of Knowledge Management, Indian Council of Agricultural Research, stated that it was a unique opportunity for the scientific community working in the area of natural resource management. The program included hands-on training on numerous technologies such as the laser land leveler, turbo seeder, multi-crop planter and mechanical transplanter. Participants further benefited from visits to participatory and strategic trials and agricultural implements’ manufacturing sites. This article is authored by H.S. Jat, Senior Scientist, CIMMYT; P.C. 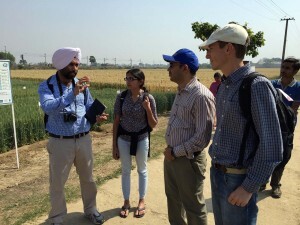 Sharma, Principal Scientist, ICAR-CSSRI, Karnal; and Kiranjot Kaur, Consultant, CIMMYT. In a study published last month in Food Security, CIMMYT researchers reported that wheat farmers’ total annual income increased by 6% on average with the introduction of zero tillage (ZT) in Bihar. While studies done in the past in the eastern Indo-Gangetic Plains (IGP) have shown ZT impacts in field trials or controlled environments, this research is believed to be the first that studied actual impacts in farmers’ fields. ZT allows direct planting of wheat without plowing, sowing seeds directly into residues of the previous crop on the soil surface, thus saving irrigation water, increasing soil organic matter and suppressing weeds. “We found that the prevailing ZT practice, without full residue retention, used by farmers in Bihar has led to an average yield gain of 498 kilogram per hectare (19%) over conventional tillage wheat, which is in contrast to the results of a recent global meta-analysis” says Alwin Keil, Senior Agricultural Economist, CIMMYT and the lead author of this study. The global meta-analysis published last year compared crop yields in ZT and conventionally tilled production systems across 48 crops in 63 countries. It reported that ZT is only profitable in rainfed systems and when it is combined with full residue retention and crop rotation. “However, in Bihar, marginal and resource-poor farmers cannot afford to leave the full residue in the field as they use the rice straw to feed their livestock,” says Keil. According to Keil, the divergent findings of the meta-analysis may be caused by the fact that most of the reviewed studies were conducted in moderate climatic zones (U.S., Canada, Europe, China) and results were aggregated across various crops. Compared to the prosperous northwestern states, the eastern IGP is characterized by pervasive poverty and high population density, and its resource-poor farmers are more prone to the risks of climate change. Bihar has the lowest wheat yields in the IGP with an average of 2.14 tons per hectare. To feed a growing wheat-consuming population, Bihar currently imports wheat largely from Punjab, where yields have stagnated over the last five years due to an over-exploitation of resources, especially water. While ZT is widespread on the mechanized farms of Punjab and Haryana, seat of the first Green Revolution in India, farmers in the eastern IGP are yet to benefit. “There is also evidence that the positive effect of ZT is larger in areas with low agricultural productivity (generally low yields, such as Bihar) than in areas with higher productivity (such as Punjab, for instance),” remarks Keil. The study concludes that ZT users reap substantial benefits, and that this technology could help close the growing yield gap between production and consumption of wheat in Bihar. A 19% yield increase would translate into a production increase of 950,000 MT, which exceeds the total wheat imports into Bihar (868,000 MT in 2011). However, with low ownership of tractors and ZT drills, large-scale adoption of ZT in eastern India hinges on an expansion of the network of service providers, who can custom-hire these kinds of services to smallholder farmers. With public and private sector partners, the CIMMYT-led Cereal Systems Initiative for South Asia (CSISA) has supported the development of ZT service providers among tractor owners by facilitating the purchase of ZT drills and providing technical trainings and know-how since 2009. Consequently, the number of ZT service providers in Bihar increased from 17 in 2011 to 1,624 in 2014, servicing a total of approximately 44,700 acres. “Furthermore, we found that only 32% of non-users of ZT in our sample were aware of the technology. Hence, increasing the number of service providers to enhance farmers’ access to ZT has to go hand-in-hand with large-scale information campaigns to raise their awareness of the technology,” says Keil. The recent 7.6 magnitude earthquake that struck Nepal on 25 April, followed by a 7.3 magnitude aftershock on 12 May and several hundred additional aftershocks to date, has had huge negative impacts on the country’s agriculture and food security. Around two-thirds of Nepal’s population relies on agriculture for their livelihood and agriculture contributes to 33 percent of Nepal’s GDP. It is estimated that about 8 million people have been affected by the earthquakes, with smallholders in hilly regions being most hard-hit. The earthquake damaged or destroyed agricultural assets, undermining the longer-term food production capacity of farm families and disrupting critical input supply, trade and processing networks. Farmers lost grain and seed stocks, livestock, agricultural tools and other inputs, and are facing significant shortages of agricultural labour. Widespread damage to seed and grain storage facilities have affected smallholder farmers’ ability to secure their harvested crops through the rainy season. In response to the devastation, USAID-Nepal has provided US$1 million for earthquake relief and recovery to the CIMMYT-led Cereal Systems Initiative for South Asia in Nepal (CSISA-NP). The Earthquake Recovery Support Program, for a period of 13 months, will be implemented in close coordination with the Ministry of Agricultural Development (MoAD), Department of Agriculture (DoA), Department of Livestock Services (DoLS), Nepal Agricultural Research Council (NARC) and District Disaster Relief Committee (DDRC). The districts that will receive support include Dolkha, Kavre, Khotang, Makwanpur, Nuwakot, Ramechap, Sindhupalchowk, and Solukhumbu, which have suffered particularly high levels of damage. “Even if seed is available, the capacity for farmers to plant and harvest crops has been severely diminished due to the loss of draft animals and the exacerbation of labor shortages,” said Andrew McDonald, CIMMYT Cropping Systems Agronomist and CSISA Project Leader. “We will reach more than 33,000 farming households through seed and grain storage facilities, mini-tillers and other farm machines, agricultural hand tools, technical training and agronomy support,” added McDonald. The program will provide 50,000 grain storage bags, 30 cocoons for community grain storage, 400 mini-tillers and other modern agriculture power tools (e.g., reapers, maize shellers, seeders), 800 sets (5 items in a set) of small agricultural hand tools, and 20,000 posters on better-bet agronomic practices for rice and maize. “We will first focus on getting small horsepower mini-tillers into affected communities, and subsequently broadening the utility of these machines to power a host of essential agricultural activities including seeding, reaping, threshing and shelling, as well as powering small pumps for irrigation,” said Scott Justice, Agricultural Mechanization Specialist, CSISA-NP. At the program’s inception workshop held recently on 28 August, Dr. Beth Dunford, Mission Director, USAID Nepal, remarked that USAID-Nepal has arranged a special fund to help earthquake-affected people. Beyond the devastation of houses, public infrastructure like roads, the earthquake has seriously disrupted the agriculture and rural economy throughout the impacted districts. Re-establishing vital agricultural markets and services in the aftermath of the earthquake is key to how quickly these communities will recover, underlined Dunford. For effective coordination and monitoring of activities in the program, Central Level Management Committee, District Level Management Committee and Local Level Management Committee have already been formed. They aim to identify most earthquake affected areas within a district and will ensure efficient and transparent distribution of support items. Dr. Adhikari, Joint Secretary, MoAD, highlighted that the Ministry feels a real sense of ownership over this program and is committed to implementing the activities through its network. He said the farm machinery support program will be a perfect platform for MoAD to expand its farm mechanization program into other areas of the country. The Earthquake Recovery Support Program also aligns with the Agriculture Development Strategies of the Government of Nepal, which focuses on community-wide inclusive development. In August, ILRI organized a workshop entitled ‘Improving Livestock Feeding Practice and Enhancement of Feed and Fodder Availability in Odisha’ in collaboration with Society for Management of Information, Learning and Extension (SMILE). It was inaugurated by Pradeep Maharathy, Minister, Agriculture, Fisheries and Animal Resources Development Department, Government of Odisha. The minister, in his inaugural address, placed special emphasis on promoting green fodder cultivation and feeding of processed and enriched crop residues especially paddy straw and maize stover to dairy animals in the state. Gokul Chandra Pati, Chief Secretary, Government of Odisha, urged participants to focus on three key issues – high cost of animal feed, severe shortage of green fodder and lack of awareness among farmers about balanced feeding practices with available resources. He encouraged farmers to adopt better feeding practices by cultivating fodder as crop, which could be integrated in their annual cropping calendar, instead of relying solely on concentrate feed, which is not cost-efficient. Highlighting ILRI’s work, Agricultural Economist Nils Teufel shared that livestock is already playing an important role in improving livelihoods in South Asia and that these same efforts can be replicated by applying relevant research findings to the Odisha context. During the workshop, findings from 10 scientific papers on feed and fodder were presented. Participants of the workshop included academics from OUAT and Utkal University, senior government officials, representatives from Orissa State Cooperative Milk Producers Federation (OMFED), farmers from across the state and national NGOs such as JK Trust and BAIF Development Research Foundation. Farming is the main source of income in Amdubi village of Odisha’s Mayurbhanj district and livestock plays a major role. But feeding livestock can be challenging since the plots of land are small as well steep and mostly devoted to growing rice, maize and vegetables. The cattle are fed at home until after harvesting when they are allowed to feed on the remaining straw in the rice fields. Since they lack the resources to regularly purchase feed from the market, most farmers have to resort to feeding their livestock with broken rice and bran produced at home. Although farmers of this village grow maize, they never feed maize stover to animals. As dairy farmer Suchitra Behera from the village points out, “Milk is a fallback to crop failure and it improves the nutrition of my family members. Every day, we have milk to drink even when it is too little to sell.” Despite receiving only seven years of formal education, Behera tries to educate her two daughters and one son besides also managing the household. 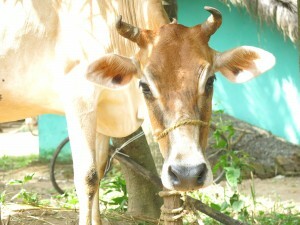 Out of the total milk produced, she sells 80-90 percent to a middleman at approximately US$ 0.30 (Rs 20) per liter and the remaining 10-20 percent is kept for household consumption. In the absence of a milk cooperative, she is forced to sell the milk at a much lower rate. Behera is a member of the Kala Mahajan Group self-help group for women, which allows her to draw the money she needs for farming expenses. She has also been recognized as a promising dairy farmer by the local animal husbandry department on account of her keen interest and hard work. The International Livestock Research Institute (ILRI), under the Cereal Systems Initiative for South Asia (CSISA), introduced crop residue-based, especially maize stover, feeding strategies in the village to improve milk production of dairy animals and also provided the initial chopping machine. Before this training, farmers were feeding their animals the intact paddy straw, as well as maize leaves, which are difficult for the animals to digest and contain oxalic acid, which can be poisonous to cattle. Now, farmers go to the village center where the machine is placed and get more chopped stover to feed their cattle while only having to pay for the occasional maintenance of the machine. Behera, who also received training from ILRI, is now able to feed her animals properly as well as save straw by half by feeding underutilized crop residue (maize stover) using less concentrate feed. Most importantly, she and her fellow dairy farmers are producing more milk. They feed the chopped stover to the animal in a bowl, which decreases the risks of contamination, improving the animal’s health in the process. The milk yield per animal has increased by 500 ml per day, making the economic benefits even more significant. One of the most essential resources in agriculture is water. For instance, it takes 2,497 liters of water to produce one kilogram of rice. With climate change, water supply of farmlands will be greatly affected. By 2025, around 15–20 million hectares of irrigated rice will suffer from some degree of water scarcity. Given this adverse scenario, managing water resources will be a tough challenge and improved water management through water-saving practices will be vital in safeguarding agricultural production in the future. Empowering young people to be catalysts of change can help solve many challenges in the future. Young scientists must play a leading role in such efforts to help shape a new image for modern agriculture. Bibhu Prasad’s interest in working with farmers grew upon moving to the rice belt of Sambalpur in Odisha. Born in the coastal Puri District of Odisha, Bibhu Prasad was introduced to agriculture early on in life. His father worked in an agricultural company marketing pesticides. 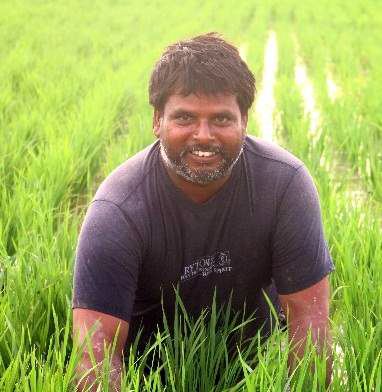 Driven by his ambition to serve people in farming communities through rural development, Prasad received his bachelor’s degree in agriculture at Orissa University of Agriculture and Technology (OUAT). His interest in working with farmers in rural areas grew upon moving to the rice belt of Sambalpur in Odisha after graduation. He is currently pursuing his master’s degree in extension education from the same university. 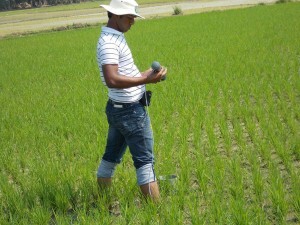 Prasad is one of the nine students who received a research grant under the collaborative research activities of the Cereal Systems Initiative for South Asia (CSISA) and OUAT. Funded by USAID and the Bill & Melinda Gates Foundation, CSISA makes use of strategic partnerships, participatory technology development, future-oriented cropping systems, research, and capacity building to catalyze locally appropriate, sustainable change in rural communities within and across South Asia. In 2013, the university sought support for capacity building of young scientists who will conduct their research and catalyze its delivery process. His goal is to advance research on AWD in Odisha and develop extension models for dissemination of the technology. “We are trying to disseminate the AWD technology to the farmers and study their adoption behavior in terms of their knowledge and attitudes, as well as constraints in adopting AWD. Along with this, we will observe the operational efficiency of the technology for the microfarming situation in Odisha,” he adds. Farmers were exposed to the technology through awareness meetings, field days, information materials (fact sheets), and face-to-face interaction. Prasad is also conducting a survey to assess some socioeconomic parameters. Ipsita Kar wants to help overcome poverty through rice science. Ipsita Kar finished her schooling in Delhi Public School, Nalco and pursued her bachelor’s degree at OUAT. She moved to Meghalaya for her master’s degree at Central Agricultural University. 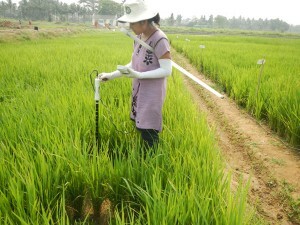 Now, she is pursuing a PhD in Agronomy from OUAT under the CSISA-OUAT collaborative project. “Working with CSISA has opened up my mind and broadened my view toward practical research, which would help people,” Kar shares. The article is authored by Gladys Ebron, Public Relations Officer at IRRI. It was originally published in Rice Today, an international magazine dedicated to the world of rice. Satellite technology provides invaluable data that allows scientists to observe growth trends, study yield gaps and target technology and inputs to increase agricultural productivity. A collaboration between CSISA and Stanford University, U.S., is exploring how remote sensing-based information can help increase wheat yields in the eastern Indo-Gangetic Plains (IGP). Wheat is a staple crop in northern India, providing approximately 20 percent of household calories. India’s ability to provide enough wheat for its growing population over the coming decades, however, is uncertain given that wheat yields have stagnated and are predicted to decrease due to warming temperatures. Yet, farmers may be able to improve yields by altering their management strategies, like shifting sowing dates or more appropriately targeting inputs. Doing this may help narrow the existing yield gap; some studies estimate that wheat yields are approximately 50 percent of what could be achieved with optimal management practices. In early March, David Lobell (first from right) and Meha Jain (third from right) from Stanford University, US, visited CSISA sites in Bihar. Stanford is acquiring high resolution remote sensing data for some CSISA sites to validate their yield prediction algorithm and CSISA is helping them acquire ground level data through crop cuts. With the aim of improving agronomic management practices, Stanford University is working with CSISA to use satellite imagery to better understand the causes and spatial patterns of yield gaps across the eastern IGP and target and assess the impact of CSISA’s different intervention strategies, like the introduction of zero-till machinery and precision broadcasting of fertilizer. Satellite imagery provides a wealth of data, with which can be used to map the characteristics of farmers’ fields, like crop type, sowing date and yield across space and time. The benefit of using remote sensing of satellite images instead of conventional data collection methods (like social surveys) is that it is a low-cost way to collect information over thousands of farmers’ fields over multiple years. This data can give a historical perspective of farming practices and insight into the heterogeneity among management practices and yields across a given landscape. As the average size of fields in the region (approximately 0.3 ha) are typically smaller than the resolution of readily-available satellite imagery, like MODIS (250 m) and Landsat (30 m), it has been difficult to map field-level characteristics of smallholder farms in the eastern IGP. To overcome this challenge, Stanford is partnering with satellite companies like Skybox and Planet Labs, which are producing and providing high-resolution data (1–5 m). These high-resolution images will be used to map characteristics of individual farmers’ fields, as well as within-field heterogeneity. Field data from CSISA has been instrumental in testing and validating the models, which researchers at Stanford are currently using to estimate sowing dates and yields using satellite imagery. Additionally this research will use the information provided by satellite data to help understand yield trends, identify where intervention strategies may best be targeted and measure the impact of various intervention strategies through time. Specifically, it aims to map the yield of wheat across northern India and assess what factors (such as weather, seed variety, sowing date) are responsible for changes in yield through time. This partnership will also explore the use of satellite data to map key biophysical parameters of the agricultural landscape, which can lead to effective targeting of appropriate interventions. For example, a set of villages that are persistently low yielding compared to their neighbors can be provided with appropriate inputs to help close the yield gap and enhance the production of smallholder farmers. Written by David Lobell, Associate Professor at Stanford University in Earth System Science, Deputy Director of the Center on Food Security and the Environment and Meha Jain, Postdoctoral Research Fellow at Stanford University in Earth System Science.